Last Friday I told you about the Inception Snap-A-Tag promotion that ends today with the release of the DVD and Blu-Ray, which will unlock a never-before-seen special feature with Christopher Nolan. 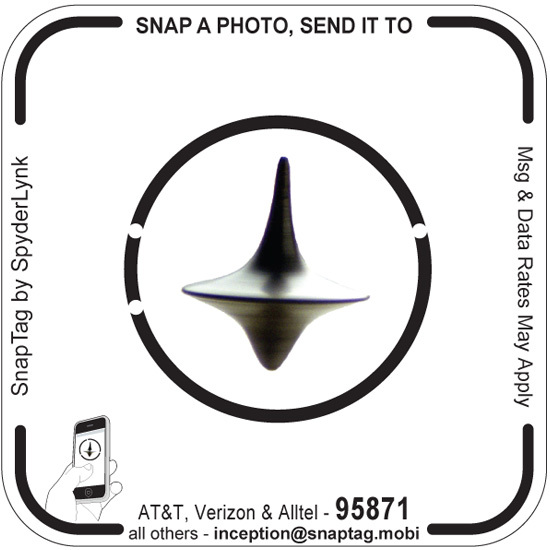 Consumers only have to snap a photo of the Snap Tag found on various Inception advertising materials with their camera phones and send the photo via MMS to 95871 (for AT&T, Verizon, and Alltel customers) or as an email to [email protected] to get a reward. Find out how to win a copy of the DVD/Blu-ray combo after the jump! Inception marked the fourth time that actor Michael Caine has worked with director Christopher Nolan. What other three films did he appear in? U.S. residents only. You must be 18 years old. Only one entry per person per day and a winner will be chosen at random. Contest ends at 11:59 PM EST on December 26, 2010. Contest! Win LINCOLN DVD/Blu-ray Combo! Contest! Win SECTOR 7 Blu-ray/3D Blu Combo!